We live to fly the W one more time! Photo courtesy of The Chicago Tribune. This is a shot of the overflow in front of Wrigley Field Sunday night. 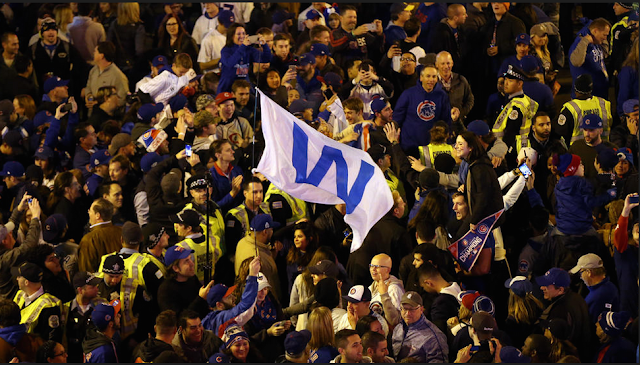 Fans (and police) are milling about outside the stadium, cheering the Cubs' improbable victory over the Indians. Now the series is 3:2. My boys in blue have won two in a row before.Go, Cubs, Go! PS And if they don't win two in a row in Cleveland, well, this season has felt like a gift and I'd never complain. My team is in the World Series!